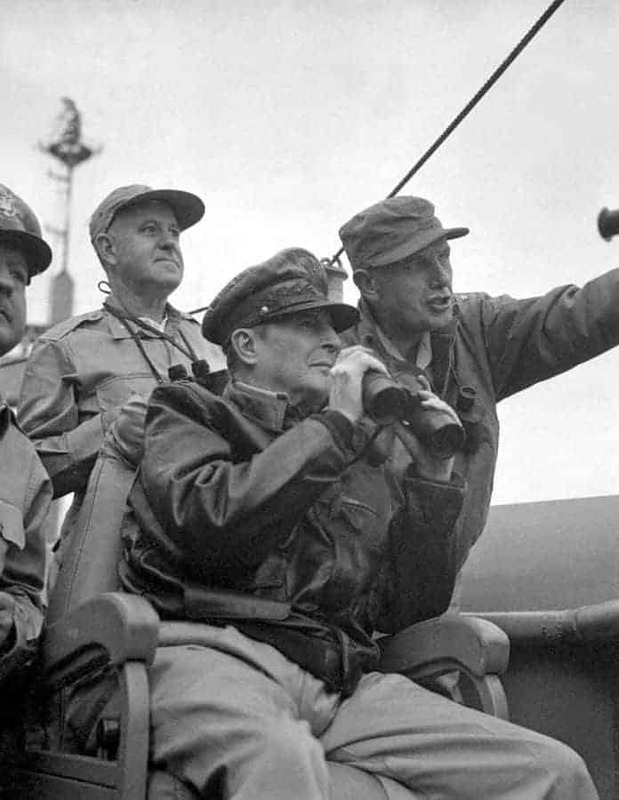 This day in history General Douglas MacArthur was appointed the commander of the UN forces in Korea. His role was to defend the South Korean people against the aggression of North Korea. He was ordered to repel the North Korean invasion and to remove its army from South Korean territory. The UN security council had voted that all UN soldiers and personnel be placed under American military command. President Truman made Douglas MacArthur the commander. The decision to appoint MacArthur was greeted with enthusiasm as Mac Arthur was regarded as a national hero. Mac Arthur came from a military family he had been commissioned in 1903. During WWI he had served on the Western Front and made a name for himself as a daring officer. After the war, he was posted to the Philippines and here he served in a variety of roles. As Japan became more aggressive in the Pacific, Roosevelt was appointed as overall commander in the region. After the attack on Peral Harbor, the Japanese invaded the Philippines. MacArthur defended the islands bravely. However, in March 1942 he was ordered to Australia when it became clear that Japan was about to conquer the islands. As he left he made the promise ‘I will return’. MacArthur was entrusted with the counter attack against the Japanese. He decided to employ an island-hopping strategy. On October 20, 1944, after advancing island by island across the South Pacific, MacArthur returned to the Philippines to liberate the island. He also oversaw the Japanese surrender in August 1945. He was made the military governor of Japan and made many reforms that have deeply influenced the development of that country and its society until today. After North Korea invaded South Korea, he became the UN’s overall commander. He organized a daring amphibious landing at Inchon and this forced the North Koreas to fall back. MacArthur then advanced into North Korea and pressed almost as far as the Chinese border. This may have provoked the Chinese to enter the war. The attacked Mac Arthur and drove him back to South Korea. When Mac Arthur sought to drop an atomic bomb on China, Truman refused. Mac Arthur publically threatened China with the bomb and this ultimately led to his dismissal from his command. For his action against General MacArthur, the celebrated hero of the war against Japan, Truman was subjected to a torrent of attacks, and some Republicans called for his impeachment. When MacArthur returned to America he announced his retirement from the army. He told Congress that ‘old soldiers do not die they only fade away’. Later he unsuccessfully run for the nomination as Republican candidates for the Presidency. Mac Arthur died in 1964. A much revered figure he was widely seen as one of the heroes of WW II.